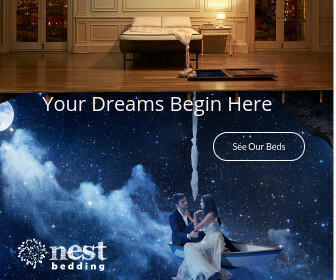 HE NEST BEDDING PROMISE We unflinchingly stand behind our CertiPUR-US certified Luxury Mattresses. All of our mattresses are thoughtfully designed and manufactured here in the USA, using industry leading materials and sourced from the USA. Our organic and natural mattresses are held to the highest of Nest Bedding standards. In addition, we promise to provide customer service that exceeds that of all other brands. Our industry leading Lifetime Comfort Guarantee gives our customers a Nest Bedding mattress years down the road, at half the price. We want you to love where you sleep, for the rest of your life. Warranty to bring you the best sleep of your life, guaranteed. Out-of-this-world Comfortable. Non-toxic. Responsibly Crafted. Damn amazing sheets. Sleep isn't just an action people take to recharge their life-batteries. it's the best part of the day.